It is my pleasure to introduce you to Blanche Burton, the namesake for Blanche's Place and my introduction to living history. Born in Ireland in 1859, Blanche, like so many from the Emerald Isle, flooded to America in hopes of a better life. Settling in the East, it appeared as if Blanche would live happily ever after, with her husband and two beautiful children. Unfortunately, Blanche's life would be filled with tragedy. Blanche and her husband divorced in the 1880s. Shortly afterwards, her son was killed in an explosion. Blanche did the only thing she thought she could do with her young daughter. She placed the girl in the protective care of nuns at a convent and headed West. One must remember, there were few options open to women at the time, especially, for a divorced Irish woman with a small child. 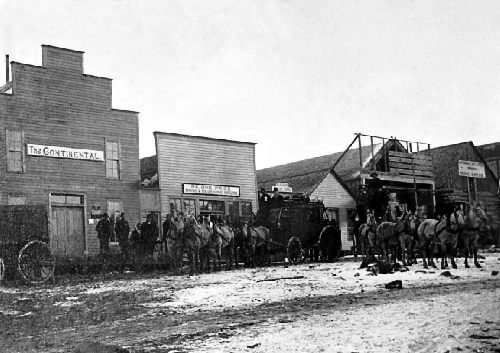 Blanche arrived in Colorado City, Colorado, around 1889. Established in 1859,Colorado City, served as a supply town for the gold/silver mines in the South Park Mining District. As most supply towns at the time, Colorado City, had its fair share of saloons and brothels. Colorado Springs, established in 1872, and located a few miles to the East, was dry, so any and all came to Colorado City for entertainment and refreshment. It didn't take long for Blanche to show up in the newspaper. Unfortunately it was in the police records, having been arrested for running a house of ill repute. Blanche, ever crafty, found a loop hole, releasing her of the charges. Afterall, how could she be running a house of ill repute when she was working out of a tent? Shortly after, news of a gold strike west of Colorado City, was causing great excitement. The world's richest gold camp, Cripple Creek, Colorado, was turning carpenters into millionaires over night. Blanche decided it was time to pack up her tent and head up Ute Pass to the gold fields of Cripple Creek. When Blanche arrived in Cripple Creek, she met Bob Womack, who had discovered gold.Bob suggested she set up her tent in what was known as Poverty Gulch, which really is no indication of the wealth in the area. Although Bob discovered gold, he did not reap the benefits, dieing penniless, in his sister's boarding house. Business was good with all of those hard working miners. Business was so good in fact, Blanche moved down onto the main part of town and opened her own brothel above one of the saloons on Bennet Avenue. Blanche became the first madam of Cripple Creek! As with any gold town in its infancy, there were very few laws and the need to enforce them. As proper women moved into the camps, they pushed for laws to keep the working girls off of the streets. In time it was decreed that all of the "girls" would be moved one block South to Myers Avenue. Blanche at this time was 30 and considered well seasoned for her profession. She decided it was time to retire and move back to Colorado City. She moved into a small house along the avenue and listed herself in the city directory as a dress maker. Blanche became well known for her generous heart. Although her finances were slim, she always found extra to help out the less fortunate. She accumulated a varied assortment of pets, as she was always taking in strays and abused animals. Forces dedicated in saving the masses from themselves, and the methods they used reached epic proportions. In 1909, the entire red light district went up in flames. Although, many of the more prosperous establishments rebuilt, this forced many others out of business or to move away. Although Blanche was retired and worked to help others, she still experienced the wrath of the righteous. Shortly before the fire in the red light district, she experienced a fire herself, which consumed her barn. She lost her prized driving horse as well as her pet dog, and narrowly escaped herself. A few months later, Blanche was at home, sitting at her desk next to an open window, when suddenly and unexpectedly, her oil lamp was knocked over, the oil spilling onto her dress and exploding into flames. Blanche ran out into the street, her screams of agony bringing two constables who were patrolling the area to her side. They used the snow from the ground where she was laying to put on the fire. They then carefully carried her back to her home. As news of the incident spread, Mamie Rodgers, the Queen of the Red Light District, ran to Blanche's side. In her dying breath, Blanche asked Maime to contact her daughter in Illinois. Blanche died before she was able to tell exactly where her daughter lived. There was no money for a funeral, because just the evening before, Blanche purchased a ton of coal for a destitute family. Blanche was laid to rest three days before Christmas on December 22, 1909. Maime Rodgers paid for her funeral. Blanche remained unmarked until 1989 when Charles Henderson, former mayor of Colorado Springs took a fancy to those ladies. Thanks to the assistance of the Rotary club, Blanche was finally given a gravestone 80 years after her death. The quote is from another well known Colorado madam's stone, Mollie May of Leadville, Colorado.